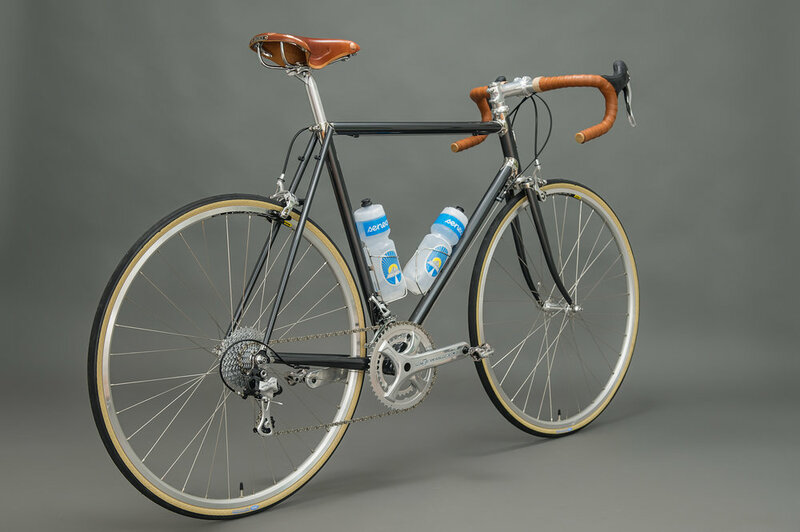 Presenting a new, French inspired, fully integrated randonneur bicycle! It has everything, and it is truly light, fast, and comfortable. 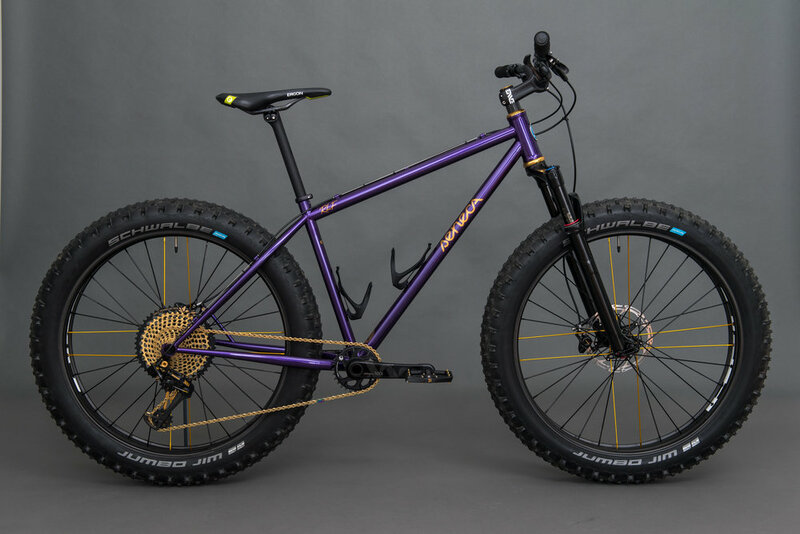 While I have been interested in building a bicycle like this for some time, and while I have built bicycles before with some of the specific features that make this bike unique, this is the first one that I have made that integrates all these features into one machine. Indeed, many of the features found on this bicycle are directly influenced by the work of the great French constructeurs active in the mid-20th century, including Alex Singer, René Herse, Jo Routens, and the like. The fully-integrated randonneuring bicycle is quite popular these days, largely due to the influence of Jan Heine and his publication, Bicycle Quarterly. 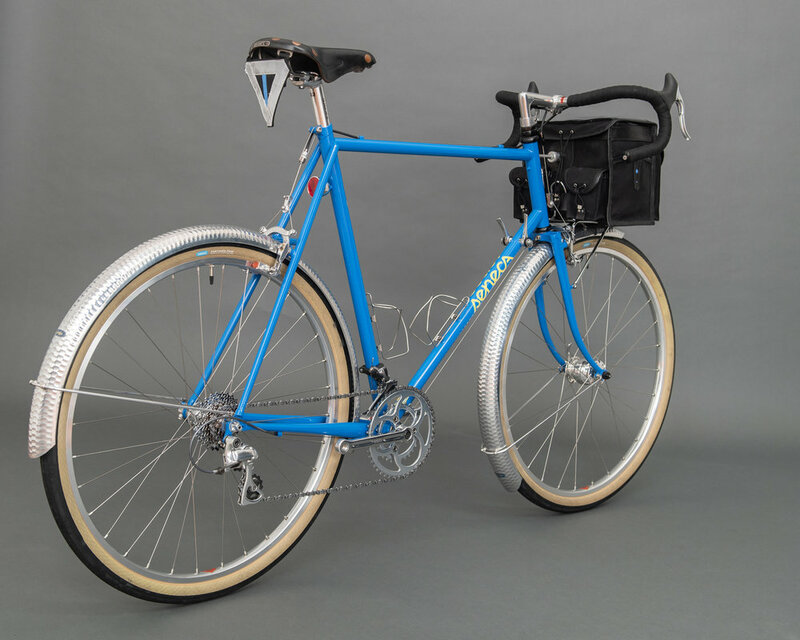 Features like integrated LED lighting and a generator front hub, full coverage fenders, a front bag and rack, 650b x 42mm tires with lightweight casings, and low-trail frame geometry for optimized handling all contribute to a randonneur bicycle's general usefulness. But one cannot simply add these features to a bicycle and expect to end up with a high performance, durable machine. Rather, It is the way that all of these elements are carefully considered during the design phase that ends up being so important: each element has to work in concert with the rest. Take the front bag, for example. This fine bag was made by Dave Cain of Waxwing Bag Company based in Waitsfield, VT. I have worked with Dave before, and he continues to impress with his handiwork and design sensibility. While the general design of front bags like this has been mostly "figured out" by now, it is the small details that make this bag so functional. Things like a map pocket on top, a top flap that opens out so that the bag can be accessed while riding, elastic closures with nifty little leather tabs underneath the hooks for extra security, and the general dimensions of the bag are all wonderful. The bag attaches to the minimal front rack underneath with a pair of Grand Bois bag clips, in addition to the ingenious Dock-It decaleur that was designed by Tom Matchak. These three mounting points make a solid, sure connection while also allowing the bag to be easily removed when the bike is parked. Normally, a bag filled with an extra few pounds of gear on the front rack of a bicycle will upset its handling characteristics. By designing the bicycle's geometry around a particular front load configuration, handling can be optimized to minimize the effect of this extra weight. This particular bicycle has relatively low trail, and when combined with wide tires (run at low tire pressures) and a small front load, handling is precise and cornering is intuitive. A curved handlebar (somewhat exaggerated in this photo by distortion from the wide angle lens) is comfortable on the hands for long rides. "Old school" down tube shifters are lightweight and simple, and almost never break or need adjustment. Wiring for the lights runs inside the frame tubing to make things simple and clean and reduce the likelihood of a wire getting snagged. 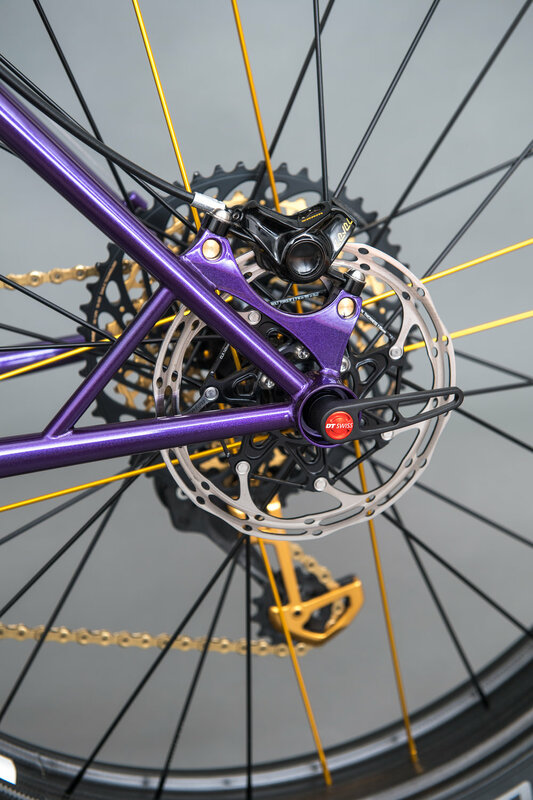 The front generator hub's electrical contacts are built into the fork dropouts, eliminating the need to connect wires when installing the wheel (this is especially handy when fixing a flat tire out on the road). Super light frame tubing provides a lively feel and absorbs bumps. 46/30 chainrings and a 12/28 cassette provide a nice gear range for spirited riding and hilly terrain. A Shimano Dura-Ace long cage rear derailleur (from almost 20 years ago!) shifts perfectly, and a newer Shimano CX 10-speed front derailleur works very well with the small chainrings. 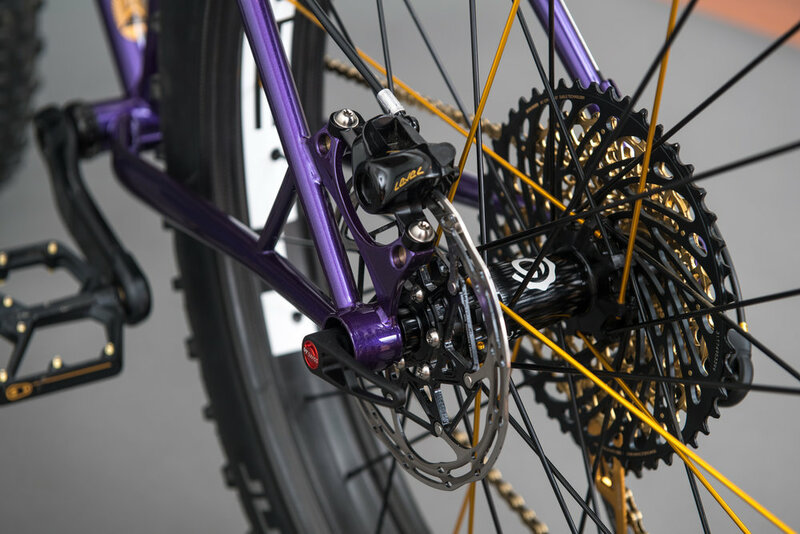 Centerpull brakes provide excellent modulation and ample power. The full-coverage Honjo fenders are beautifully hammered, super light, and durable. They make riding in the rain almost pleasurable! Besides being a real challenge to build, bicycles like this are so full of little details that, on their own, are lost. But each part has its purpose, like the small leather washer in between the rear fender and the seat stay bridge in the pic above. The end result is a bike that rides wonderfully, quietly, and requires very little maintenance. A bike like this can take you pretty much anywhere there is a road to be found (be it paved, dirt, or gravel), day or night, rain or shine. See below for a slideshow of the complete photo set. There is something particularly stunning about the combination of stainless steel lugs and the beautiful glossy metallic silver paint chosen by the owner of this new bicycle. 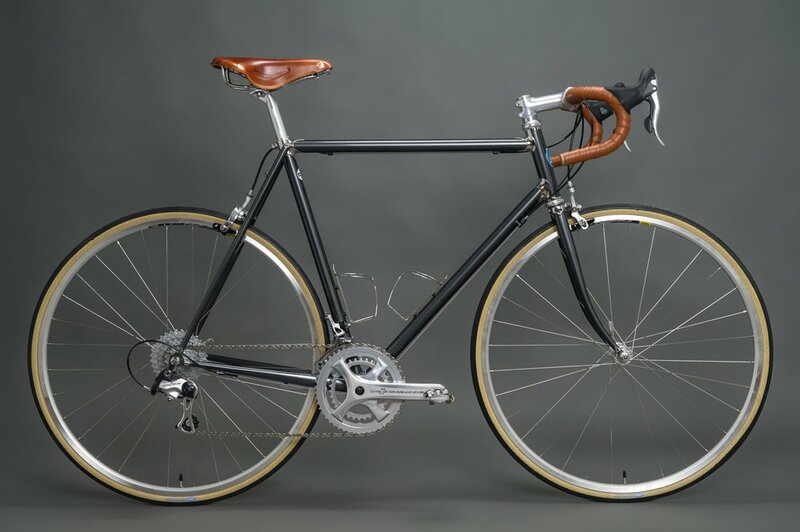 The customer, a Putney local, envisioned a bicycle that has the classic style of a lugged steel road racing bike, built with modern steel materials and components. The frame is constructed from Columbus Spirit tubing, which is light and lively and designed specifically for lugged frames. The lugs themselves are stainless steel, investment cast, and polished to a mirror finish. While the polishing is done by hand and is very labor-intensive, the end result is completely worth it. 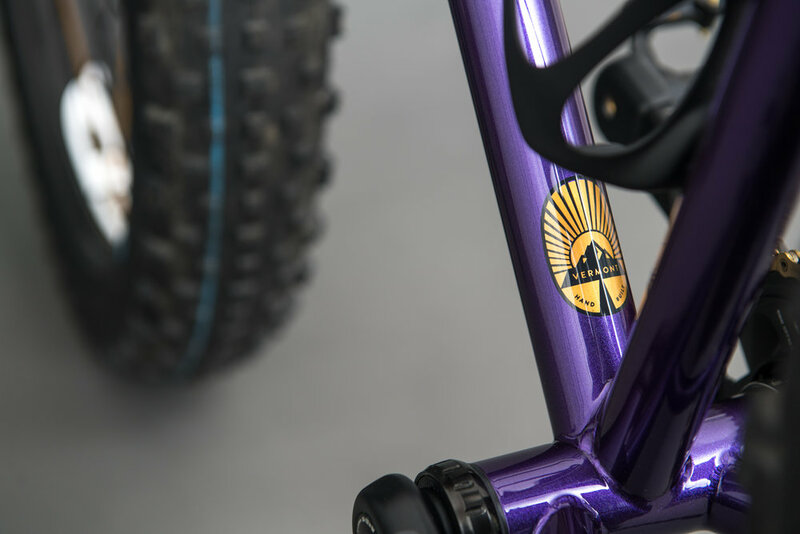 Components were carefully chosen to complement the classic style of the frame and fork while providing excellent performance. Silver Potenza components from Campagnolo, White Industries hubs laced to Mavic rims, and the Ritchey Classic bar, stem and seatpost work in harmony with a Brooks saddle and handlebar wrap for a comfortable, reliable and beautiful parts kit. A compact crankset with 34t and 50t chainrings, plus an 11-32t cassette, provide a wide range of gears. Ample clearance for larger tires comes standard on just about every frame and fork that I make. Shown here are 700c x 26mm Extralite Cayuse Pass tires by Compass Cycles. Visually, I think there's nothing quite like classic road bicycle geometry with a horizontal top tube. The Campagnolo rear brake cable and housing gracefully arc over the stainless steel seat stay cap. A pair of rack eyelets allow mounting a rear rack if ever needed. Designed and built right here in my Putney workshop! 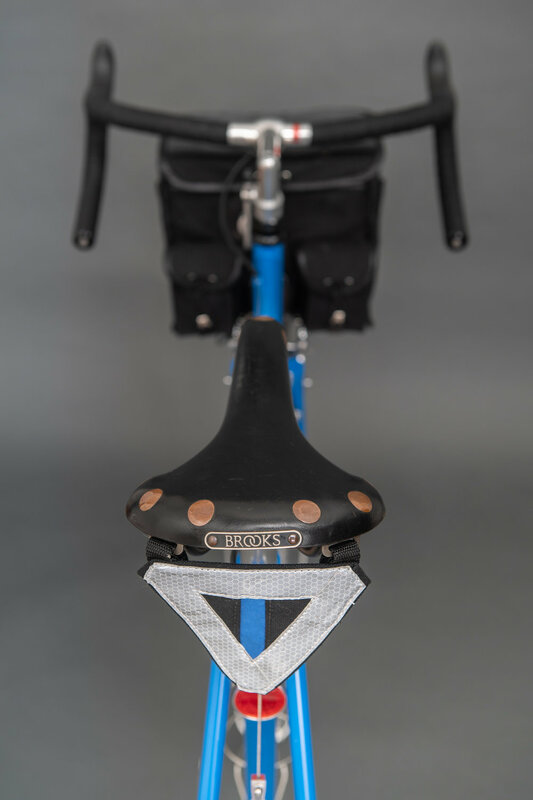 Dave Cain of Waxwing Bag Co. (in Waitsfield, VT) provided a custom made saddle wedge for added storage capacity during longer rides. He managed to match the coloring of the Brooks saddle and bar wrap perfectly. Thanks Dave! What can you see in the reflection? See those shifter cables below the down tube? 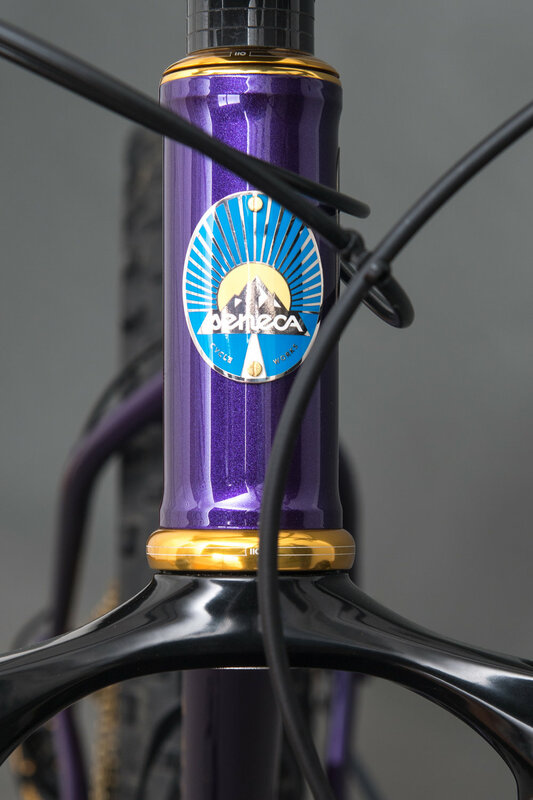 Criss-crossed cables make for smooth housing runs from the handlebar to the shift cable barrel adjusters. When routed this way, the housing naturally sits away from the head tube, relaxing the cables a bit and preventing paint rub where housing would otherwise contact the head tube. To Dano, the owner of this new bicycle: thank you very kindly for the opportunity to help make your bicycle dreams a reality. My hope is that you will enjoy this bike for many, many years to come! I look forward to seeing you out on the road.